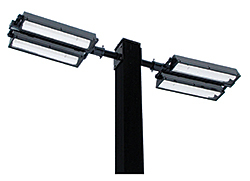 W1PL502SL Series dual lighthead luminaires for pole-mounted street, parking lot and area lighting are available in dimmable, controllable, wireless “smart” photo-cell options. The rectangular trapezoidal shapes are arm- or tenon-mounted. Provides 90 percent maintained instant-on lumens with up to 50,000-hour operating life to -25 F.